Only an external impact could have caused a Russian plane to dive into the Egyptian desert, killing all 224 people on board, the airline said Monday, adding to a series of incomplete and confusing statements from investigators that left unclear why the plane broke up in mid-flight. Alexander Neradko, head of Russia’s federal aviation agency, told reporters on Sunday that the large area over which plane debris fragments were found indicates the jet disintegrated while flying at high altitude. He would not comment on any possible reason for the crash, citing the ongoing investigation. When planes do break up in midair, experts say it’s usually because of one of three factors: a catastrophic weather event, a midair collision or an external threat, such as a bomb or a missile. A local affiliate of the extremist Islamic State group has claimed it brought down the aircraft, which crashed in the northern Sinai, where the Egyptian military and security forces have battled militants for years. Russian officials have dismissed that claim as not credible. The flight recorders will provide key information, including the plane’s airspeed and whether it was on autopilot. Russian officials were shown the black boxes found at the site of the crash in the Sinai Peninsula and emergency situations minister Vladimir Puchkov says they are in a good condition, Russian news agencies reported on Monday. A Russian cargo plane brought the first bodies of Russian victims killed in the crash to St. Petersburg, where many of them are from. The city, awash in grief for its missing residents, is holding three days of mourning through Tuesday. The government plane brought 140 bodies to St. Petersburg’s Pulkovo airport, touching down in the dark. The bodies were then taken to a city morgue and a crematorium, where Russian forensic experts immediately began working to identify the victims, said Yulia Shoigu, a Russian Emergency Situations official. The search for bodies at the Sinai crash site should wrap up late Monday night and another plane with more crash victims’ bodies will then travel from Cairo to St. Petersburg, Puchkov told a televised news conference. President Vladimir Putin declared Sunday a nationwide day of mourning and flags flew at half-staff across the country. Mourners have been coming to St. Petersburg’s airport since Saturday with flowers, pictures of the victims, stuffed animals and paper planes. Others went to churches and lit candles in memory of the dead. In the Sinai, aviation experts and search teams have been combing a 16 square kilometer area (more than 6 square miles) to find bodies and pieces of the jet. The Egyptian government said Sunday that 163 bodies had been recovered. 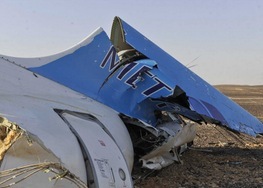 Smirnov, Metrojet’s deputy director, described the A321 as a reliable aircraft that would not fall into a spin even if the pilots made a grave error because its automatic systems would correct crew mistakes.